HEREFORDSHIRE Council is standing by the incinerator plan pitched as the future for the county’s waste despite double blows against the project this week – as reported by the Hereford Times. Support for the incinerator for reiterated at a meeting of the council this morning in responses to two questions from councillors. MPs have already turned the heat on the incinerator, criticising the near £90 million paid to the PFI project so far without the facility being built. The Commons public accounts committee questioned the basis of government grant funding for the incinerator and its future in a sector where technology is continually evolving. A report from the council’s external auditors Grant Thornton found that cabinet members did not get the detail of why officers – rather than consultants – saw an incinerator as the future with a relevant appraisal recommending cabinet support lacking detail and clarity. .
Grant Thornton has said it cannot now conclude its 2013-14 audit of the council or issue the council with its audit certificate until it has “completed consideration” of specific issues raised around the incinerator plan. The energy from waste incinerator at Hartlebury, Worcestershire, is integral to a joint 25 year waste disposal contract with West Mercia Waste signed by Herefordshire Council and Worcestershire County Council. An initial capital cost for the project is reported to be more than £160 million, but opponents claim ongoing maintenance will at least double this over the 25 years while the cost using PFI funding could triple. In February, Herefordshire Council passed a 2014-15 budget committing the council to paying £40m for the incinerator at Hartlebury, Worcestershire, over three years. A budget strategy estimated council borrowing as increasing by £50.8 million over 2014/15, pushing the overall debt up to £218.2 million, including £11 million borrowed over the year for the incinerator. At full council this morning, Cllr Glenda Powell asked for “assurance to members and taxpayers” as to the plant’s future effectiveness. Cllr Liz Harvey referenced her questioning “confidence” in capital borrowing for the incinerator at the council’s budget setting meeting in February. Then, Cllr Bramer said confidence in capital borrowing as a best value option came from analysis and appraisals in both the joint waste management strategy and a cabinet report completed in accordance with relevant government guidance. This morning, Cllr Harvey raised the findings of the public accounts committee , specifically the conclusion that the Department for environment, food and rural affairs made decisions on waste projects focused on the need to meet EU targets without regard to the impact on local authorities. Cllr Bramer said the council “does not disagree” with the findings quoted but cited the findings as focused on DEFRA’s oversight of PFI contracts. It was, said Cllr Bramer, a matter for DEFRA to respond to the committee’s findings rather than either of the two councils. The committee found PFI contracts of 25-30 years are “inappropriate” for the waste sector where technology is continually evolving with the amount of waste in hard to predict. Funding agreements for early PFI waste deals were “poorly drafted” by the then Department for Environment, Transport and the Regions (DETR) and “too lax” in requiring payments for key assets that had not been built. As such, the committee found that the funding agreement signed with Herefordshire and Worcestershire councils highlighted the “shortcomings” of early PFI projects, with payments to the council aligned with payment made by the councils to the contractor. Grant payments started as soon as the councils started to pay the contractor, with the government, through either the DETR or its successor the Department for Environment, Food and Rural Affairs (DEFRA), legally committed to making grant payments ever since. In December 1998, the DETR signed a funding agreement with Herefordshire Council and Worcestershire County Council for £143 million and the payment of related grants started shortly after. The terms of the original funding agreements did not allow central government to stop payment or alter the payment terms in the event that key capital assets were not delivered. Since its creation in 2001, DEFRA has had responsibility for overseeing these grants and did not review the agreements until 2011. Terms with Herefordshire and Worcestershire councils were not successfully renegotiated until 2013, resulting in a £30 million cut in total funding. The process of renegotiation was time-consuming. In the case, of the Herefordshire and Worcestershire DEFRA confirmed to the committee that it took them six months to approve the new funding approach the councils were proposing. With contractor apparently unwilling to fund the incinerator, the councils were left considering using the rate income generated from the populations of both counties to cover the cost of the contract. Rwandans need to observe proper medical waste management to ensure environmental health.The appeal was made during activities to mark the World Environmental Health Day yesterday.The day was marked under the theme: “Environmental Health Inequality”. “This day is important because micro-organisms are everywhere and can affect us. So maintaining a clean environment is paramount in preventing diseases,” said Enock Karekezi, from the Ministry of Health’s Department of Environmental Health. He said people living outside urban areas have access to cleaner air due to lesser pollution, while people living far away from hospitals, factories and landfills also enjoy a healthier environment because of less waste in their vicinity. 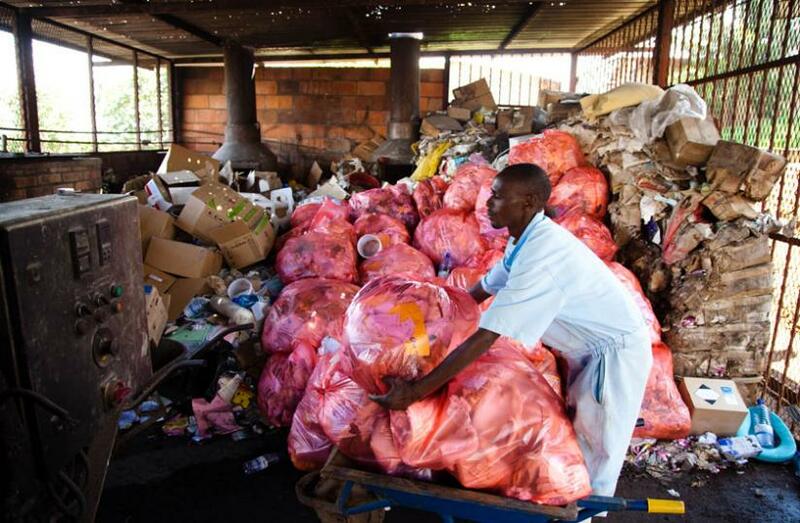 Karekezi pointed out that health care waste management is a major concern, adding that the ministry has injected Rwf1.5 billion in the purchase of seven incinerators for referral hospitals and one for the Mageragere site. A moderate incinerator burns 60 kilogrammes of waste per hour, he said. Dr Wim Schonbee, a physician at Gahini Hospital, explains that an incinerator burns needles and blood stains that may cause Hepatitis B if they get into contact with the human body. “The incinerator treats the smoke from burning the waste and releases it high up in the sky so it has no immediate effect on the environment,” Schonbee said. However, the smoke released shouldn’t be black as this is dangerous. 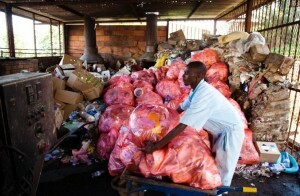 Engineer Joshua Nsabimana, of King Faisal Hospital, said incinerators are the best option to dispose of health care waste. Incinerators have a primary chamber to burn the waste introduced and then a secondary chamber to burn the resulting black smoke s0 it is released when white. That way the combustion is complete, Nsabimana explained. He added that clean plastic waste is recycled at the recycling plants but if the plastic contains medical waste that has to be disposed of, it is burnt at above the minimum heat of 500 degrees to avoid the creation of dioxin emissions which can cause environmental destruction. If the incinerators are well used, they can protect the environment from poor disposal of waste, open air burning, and control diseases. Scale of Ebola outbreak in Western Africa leaves staff of frontline health agency with grim decisions over who to treat and who to turn away. Like every other volunteer who serves with Médecins Sans Frontières, Stefan Liljegren joined up to help the sick and destitute. In 15 years with the agency, he has been everywhere from Afghanistan and Kosovo through to South Sudan and East Timor, the hard and often dangerous work compensated for by the knowledge that he is saving lives. Outside the clinic an hour earlier, a grisly scene demonstrated Mr Liljegren’s point. Resting face down in the mud was the body of Dauda Konneh, 42. He had been lying there dead since daybreak. When The Telegraph mentions this to Mr Liljegren, he nods. Having dead or dying patients outside the clinic overnight is “a regular occurrence,” he says. The reason being that once night falls, the hospital does not admit anyone: handling Ebola patients requires extreme care at the best of times, and it would be dangerous to do so in the dark. No amount of “switching off”, though, spares the MSF staff from the wider scale of the fatalities around them. The clinic, one of three now operating in Monrovia, has seen 350 deaths in the last month alone. Since all infected bodies have to be burned, the casualties have exceeded the ability of Monrovia’s local crematorium to cope. MSF has had to import an incinerator from Europe – normally used for livestock – to assist. For an aid agency that prides itself on triumphing in even the most difficult operating circumstances, it is a depressing reminder of how far there is to go. The challenges facing the MSF clinic are in turn a snapshot of the wider outbreak now engulfing West Africa. On Tuesday, a World Health Organisation study warned that the number of Ebola cases – currently topping 5,000 – could reach hundreds of thousands by January unless the aid operation was drastically increased. Nowhere is the problem more acute than in Liberia, where 40 per cent of all the deaths have taken place, and where the government health service – already badly damaged by the 1989-2003 civil war – has been paralysed by Ebola infections among its own staff. In coming weeks, a 3,000-strong US military mission will arrive in Monrovia to build 17 more Ebola treatment clinics. But MSF, which worked in Liberia throughout the civil war, says the situation is already spiraling out of control. Inside the MSF clinic in Monrovia, those patients fortunate enough to get through the gates are admitted to rows of large white treatment tents. The clinic is designed so that only staff clad in the yellow high protective gear can enter the “high risk” wards, where those with advanced stages of the virus are treated. In the nurses’ area, meanwhile, a pair of paperwork folders hung next to the door describe the patients’ only possible outcomes. One has a set of forms marked “Discharge”, given to the few who manage to fight the virus off. The other has a set of forms marked “Death Certificate”. Right now, the latter is used between 70 and 80 per cent of the time. In another section, patients who have tested positive but are not yet acutely ill congregate in an open air living room, where they can chat to each other, do exercises, and play board games. Mr Sheriff’s claim not to know how he became infected is typical. It may be that he genuinely does not know. Or it may be that he failed to take adequate precautions at his brother’s funeral but does not wish to admit it. Either way, it makes it all the harder for the medical staff to establish patients’ so-called “contract traces”, which, in an ideal world, identify exactly who else might have been infected. This would also be useful in the case of Mr Konneh, who, according to the man who brought him in, worked for Irish aid agency Concern, which itself has been conducting a public health campaign about how to avoid getting Ebola. Alerted by The Telegraph the following day, Concern confirmed that Mr Konneh, a father-of-two, did indeed work for them, although they believe he may have died from an existing medical condition which took a turn for the worse in the past ten days. Such is Ebola’s grip on Liberia, however, that right now, any sudden illness is feared to be the virus – hence Mr Konneh’s attempt to reach the clinic. The young man adds that Mr Konneh moved between two different households while sick, and that the occupants of both houses are “now very worried”.